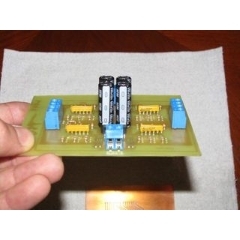 "This is a motor driver board that can drive 2 DC motors in Forward or Reverse with full speed control. It can handle at least 25 amps per channel continuously at 24vdc. I designed it using a basic H-bridge with 4 switches, 1 switch going to positive (+) and 1 switch going to negative (-) for each motor terminal." Hello,I read your new stuff named “Triple 8 H-Bridge | PyroElectro – News, Projects & Tutorials” daily.Your story-telling style is awesome, keep up the good work! And you can look our website about free anonymous proxies. Looks really simple and great, awesome post, keep up the good work! Awesome article! I want people to know just how good this information is in your article. It’s interesting, compelling content. Your views are much like my own concerning this subject. I Love to read your blog, Waiting for more updates and I already read your recent posts. Thanks for sharing this wonderful article with us. I liked it so much and very interesting, too! Thanks for sharing the experience. Wonderful post, really great tips and advice. Hi! Thank you for some other wonderful post. Where else may just anybody get that type of info in such an ideal way of writing? I have a presentation subsequent week. And I am on the search for such info.